Bitcoin-focused angel investor group BitAngels has made its first seed investment, piling $100,000 into an offshore startup community. The money goes to Blueseed, a project to house startup talent 12 miles off the California coast on a converted cruise ship. Started by a collection of people from the Seasteading Institute, a think tank researching ocean communities, Blueseed’s initial purpose is to circumvent what the founders see as restrictive US immigration laws. The difficulty of getting US visas for immigrant startup talent means that non-US citizens are being kicked out of the country and that potential business opportunities are being missed, they argue. BitAngels focuses on Bitcoin-related investments, though, so what’s the link to Blueseed? Dascalescu spoke at the Bitcoin 2013 conference, and garnered interest from that community, he said. “One investor insisted on transferring BTC, and we’ve opened an account with TradeHill for that purpose.” It also has a bitcoin address on its website for non-accredited US investors, along with investor information for accredited or non-US angels. “The problem we ultimately are tackling is competitive startup governance, a trillion-dollar and billion-customer market,” Dascalescu continued. This libertarian, floating pre-state approach is part of the Seasteading Institute’s mandate. It wants to facilitate ocean-based communities that test new ideas for government. The Institute, started in 2008, received significant funding from Californian venture capitalist Peter Thiel. 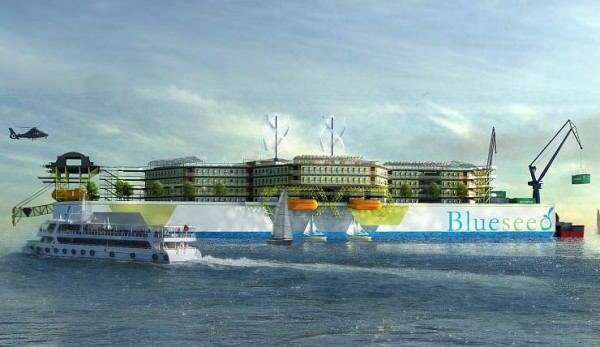 Blueseed One, which will be positioned 30 minutes by ferry from Half Moon Bay in Southern California, will accommodate 1000 entrepreneurs, or more than 300 startups in addition to 200 community support staff and 200 crew. The ship will charge a combination of rent (around $1600 per person per month) and equity for startups. They will travel to the mainland using business or tourist visas, which are easier to obtain than non-immigrant H-1B visas. There is already a long waiting list for berths on the startup ship. 22.9% of applications came from the US, with India as the next biggest source (10.6%), the “United Kingdom of Great Britain” next, (5.7%), and Canada (with 4.5% of applications). The previous round of funding for the project came from the Floodgate Fund, Correlation Ventures, and Xu Xiaoping of ZhenFund, a Beijing-based angel fund.